Texas Online Radio: Breaking News!! ~ America Comes Home! Breaking News!! ~ America Comes Home! Sources say the world awoke this morning to empty US military bases and airfields, and that US Naval vessels were sailing to home ports. "You're on your own, we've gone home. The United States of America." After decades of being the world's policeman and caretaker, America is headed home to take care of itself first. "There are issues at home that need to be addressed and repaired. ", America said in a statement today. "Our own economy and security are in dire need of repair, and we'll have to fix those things before we can help the worlds masses anymore." "We've always spent our blood, sweat and treasure to help those in need throughout the world, but it seems to be taken for granted. The world scoffs at us, calls us names and plots against us, and we're fed up. The first items on the agenda are to secure our borders, get our spending under control and send collection notices to all the countries that owe the United States. ", America went on to say in an interview this morning. For a long time, the United States has been the world's keeper, stepping up to the plate when needed, opening their wallets and their hearts to causes when needed. Only to be met with scorn and hatred. America fights your battles, loses it's young soldiers and treasure on a regular basis to the ungrateful masses that will continue to fight long after America is gone. Uncle Sam went on to say, "Have at it world! We'll be back stronger than before in the near future... In the meantime, try not to destroy each other." ....wouldn't this be a great article? Think about it... Putin today calls us a "parasite" on the world economy. Does he not remember the billions the US has given Russia and the former Soviet Union? 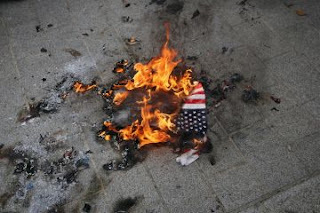 The Saudi's receive billions in aid, the Middle East receives billions in aid only to burn our flag in the streets and say we're "ugly Americans" and plot to kill our citizens. We saved Europe from the clutches of HItler during WWII, destroyed the Japanese in the Pacific at the cost of thousands of lives. We provide billions in aid to poor countries, and are the first to show up when natural disasters strike...never asking for anything in return. We open our arms to those seeking a better life, many times at the cost of our own standard of living. And we're called "ugly Americans"? No more...enough is enough. It's time to fix what is wrong with America, and if it hurts a bit... so be it. The American spirit is alive and well, it just needs a helping hand right now... and you don't see that hand from anyone outside our borders. God bless our people, our troops, and God Bless The United States of America! ...and God Bless Texas!! Get your Texas Online Radio tee shirts and gear here!! Excellent! This is probably the best article I have ever read! AMEN Jeff...you should post this whole thing on Facebook...word for word! It would be so fantastic if we would do just exactly that...shut down the world bank-food, help, resources...the whole shootin match...and just focus on what needs to be done at home...starting with a deportation from the White House...moving thru the Senate and House, then clean up state by state. Till we revive the sleeping giant that has offered so much to a greedy selfish world. We had a counselor tell us once that you cannot help others if you do not have anything to help yourself with first...and with the current administration, well, our cup is running dry do to the wholes poked in it. I believe there are enough of us here to breathe life back into our nation, but we need to make sure that our nation is still OURS, First!